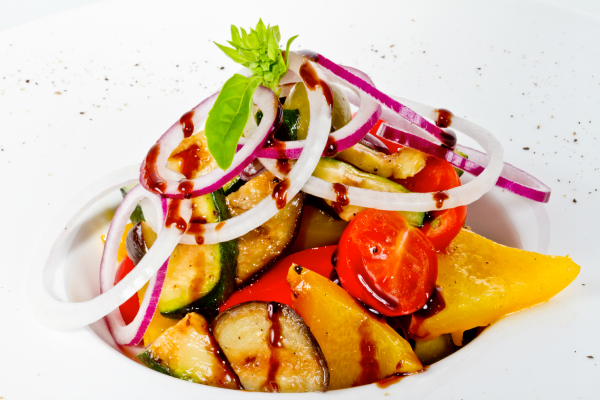 Whisk the oil and the balsamic vinegar together in a large bowl. Add the salt and pepper and whisk until completely combined. Cut the beets and onion into 1/2 inch rounds. Cut the peppers into 1 inch strips. Cut the zucchini and eggplant into 1 inch slices. Place all the cut vegetables into the oil mixture and toss to coat generously. Heat grill to medium high heat. Place vegetables on the grill and cover. Grill 5 to 7 minutes on each side or until vegetables reach desired tenderness. Serve hot.